How many whitening systems are there? There are 4 different methods for whitening the teeth. Which is the most effective method of teeth whitening? 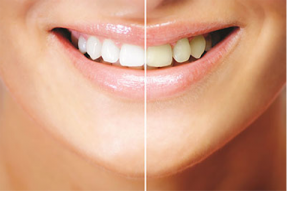 The most effective method of whitening teeth is comprehensive whitening (Both home and office bleaching). How is home whitening applied? A personal whitening tray is prepared after oral measurement is taken. Certain amount of tooth whitening gel (10-15% carbamide peroxide) is applied in this special tray. Treatment, during which the tray is worn for at least 4-6 hours per day, approximately takes 10-15 days. How much whitening gel should I put inside the tray? The point to take into account in home whitening is not to put too much gel inside the tray. Otherwise, the excess gel that overflows the tray irritates your gum tissue. In such cases, gums should be washed immediately and creams with vitamin E should be applied to the irritated area. What is office tooth whitening? It is the tooth whitening method which is used at the dental clinic. It is convenient for patients who lack enough time for home whitening. It provides effective whiteness within much shorter time. The whitening gel which is applied to the teeth by dentist is activated with UV rays or dental laser and the whitening process takes approximately 1 hour. What is combined tooth whitening? It is the method during which both the home and the office whitening are performed. After applied at the office, it is supported with home whitening for 2-3 days. What is internal tooth whitening? It is applied to the teeth which discolored after root canal treatment. The filling in the tooth is removed. Whitening gel is applied inside the open cavity. Then, the tooth is sealed with temporary filling. This session is repeated until we reach desired color. Is internal tooth whitening harmful for teeth? Root canal filling should be isolated very well. There is no harm of internal tooth whitening if it is isolated well. Are there any disadvantages of tooth bleaching? Even a little, apart from non vital teeth (which has root canal treatment), tooth whitening processes may cause sensitivity to teeth. This sensitivity might be caused by air, very hot and cold food and beverages. This situation is a normal and expected side effect. Usually, sensitivity is expected to disappear in 24-48 hours. You should consult your dentist when faced with an unexpected situation. Bleaching is the process of removing colored organic and inorganic substances which are formed in dentine pores on tooth surface with whitening gels (carbamide peroxide). How long does it take for teeth to whiten? It changes from one person to another. Teeth whitening process takes approximately 2-3 weeks. The more yellow than grey the teeth, the more effective the bleaching. Teeth’s grey color due to antibiotic use is more difficult to whiten and it may take longer time to give result. Should I clean the whitening tray? Yes, you should. The trays are washed with liquid soap and properly dried after use. You should put them in their box after you are certain that they are completely dry. The white color starts to disappear after whitening. It depends on the patient’s consumption of colored beverages (coffee, tea, red wine and coke) and tobacco. It takes 6 months – 1 year. It can be supported with 1 or 2 sessions once every 4-6 months. What should I pay attention to during tooth bleaching? You should absolutely abstain from colored beverages such as coffee, tea, red wine, and coke and tobacco products. When they are used, the process may produce adverse reaction and teeth become discolored. Does bleaching harm my teeth? Teeth bleaching under physician supervision does no harm to teeth. Otherwise, we would not use this method on ourselves and our beloved ones. It is the method which is used to activate the whitening gel applied on dentine surfaces and to shorten the time.